The cops’ repressive carding practice of stopping, questioning and documenting the personal information of Torontonians who are not suspected of committing a crime is an instrument that makes permanent suspects of Afrikan-Canadians, other racialized peoples and the general working-class. Carding is not substantively different in practice from New York City’s “stop and frisk” policy. After years of suffering under the carding regime, the Afrikan-Canadian community and other affected peoples should initiate a mass campaign aimed at refusing to share their personal information with the cops. When they are stopped in these non-criminal encounters, they should ask the police, “Am I free to go?” If they are not being detained or arrested, they should inform the cops that they will be leaving the scene. In spite of the people’s right to not share their personal information with the cops, many members of the public do not believe that they have the option of rejecting the request of these armed agents of the state. In fact, Afrikans and other peoples feel psychologically detained and are often fearful of exercising their rights. In Toronto, the cops use the carding regime to amass information on the working-class, especially Afrikans and other racialized groups. The civilian policy-making and police oversight body the Toronto Police Services Board (TPSB) has given the cops a virtual licence to carry out street harassment and racial profiling. The two main weekly Afrikan-Canadian newspapers Share and Pride have been featuring stories and opinion columns that are opposed to carding. The mass circulation daily the Toronto Star has been rolling out a steady stream of news and op-eds on carding. 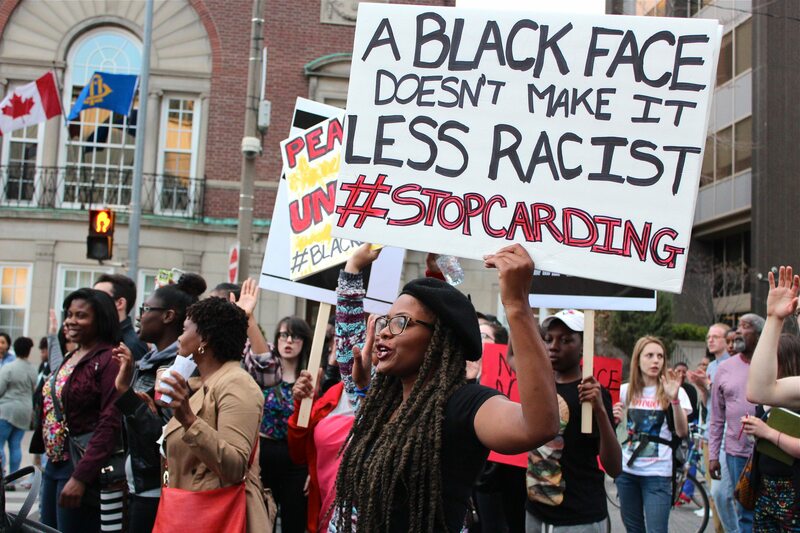 These stories are certainly helping to build mass opposition to carding and are likely cultivating a positive reception to an active carding resistance campaign.